Stop Bullying Now – The “Stop Bullying Now!” campaign was developed by the Health Resources and Services Administration in partnership with more than 70 health, safety, education, and faith-based organizations. The website, which has both children’s and adults’ sections, offers animated scenarios, public service announcements, and resources for educators, health and safety professionals, parents, children, and the general public. School Prevention of Bullying – This booklet provides an overview of what is currently known about bullying behavior and successful efforts to address it. It also profiles a number of anti-bullying programs and offers resources for further research and program development. 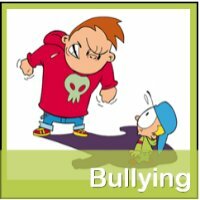 Preventing Bullying – this digest examines the problem of bullying and some of its effects, discusses steps schools are taking, looks at ways peers can discourage bullying, and identifies other strategies that are being pursued. The ABC’s of Bullying: Addressing, Blocking, and Curbing School Aggression – This online course from the Center for Substance Abuse Prevention examines the causes and effects of bullying, prevention techniques and programs, screening, treatment options, and legal/ethical issues surrounding bullying. Bullying Among Children and Youth – Stimulated by the pioneering work of Dan Olweus in Norway and Sweden, researchers from several nations have begun to explore the nature, prevalence, and effects of bullying among schoolchildren. Although studies of comprehensive antibullying programs are scarce in the United States, evaluation data from other countries suggest that adopting a comprehensive approach to reduce bullying at school can change students’ behaviors and attitudes, reduce other antisocial behaviors, and increase teachers’ willingness to intervene. Cyberbullying – when a child, preteen or teen is tormented, threatened, harassed, humiliated, embarrassed or otherwise targeted by another child, preteen or teen using the Internet, interactive and digital technologies or mobile phones.